To continue with my sprinkling of serenity amongst the madness, I offer Tuesday Show & Tell travel memories in the form of a scrapbook share - as initiated by Naive-no-more. 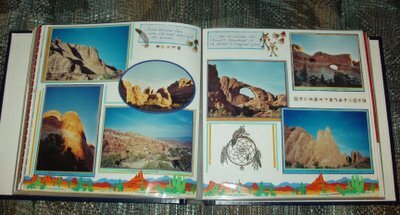 The Hub and I have taken some wonderful trips and therefore the majority of my scrapbooks are travel books. 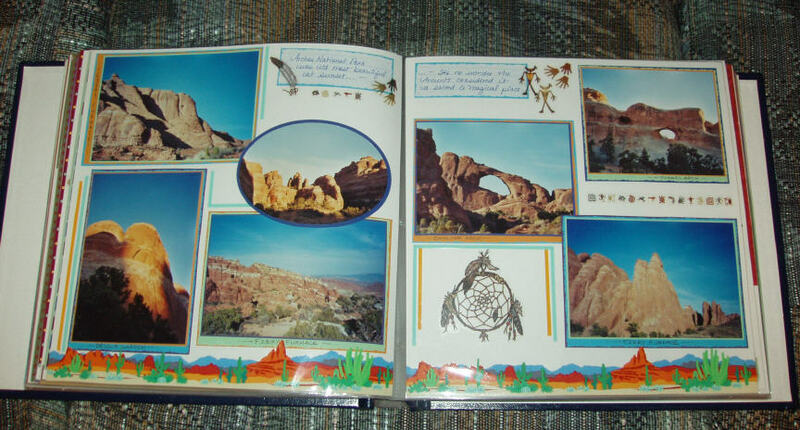 This layout features shots from Arches National Park, Moab, Utah. The landscape of Arches National Park has served as a backdrop for many movies of dramatic setting, particularly westerns. If you ever find yourself in the neighborhood I strongly recommend that you go - you will never forget it. Feiry red rock and deep azure skies will saturate your very fibers, and will become a part of you. It's one of the most beautiful places I've ever been. I agree with Nicole - I have two lovely scrapbooks that were meant to hold photos of my lovely daughter (you know from birth and beyond..?) right. They haven't had a single photo added. My daughter is three years old. I grew up in the same general proximity (give or take a few hundred miles) so I spent a lot of time there. It really is pretty amazing. Although I have to say that I like Lake Powell better. Beautiful pictures, and I do like the layout, too. Scrapbooking is just not for me, though! One of my co-workers went to Moab last year. He went mountain biking and camped while out there. It looks gorgeous! I'd love to visit Moab one of these days! I take it back. You can't come on the scrapping weekend with me after all. Pththth. Very nice scrap pages. I was there when i was 4, and you're right, I haven't forgotten it. I actually have aspirations to get back there again someday with my own kids. Love it! You have so much talent, Clew. And now you've given me another to add to my "places to visit" list. 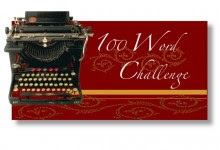 Wouldn't it be easier if we just stopped by your house and flipped through your scrap book? Love your page! We are gonna have to scrap soon!!!! Yeah, I'm a travel-holic too. Keep 'em coming. Very Nice Scrape book pages, would love to see more.